A marvelous counter-attacking display from Liverpool ensured that this oft close fought derby was over by half-time. Liverpool reintroduced the 4-1-4-1/4-3-3 shape that they used against Stoke two weeks ago. Steven Gerrard was back in the anchorman position, with Henderson ahead to the left and Coutinho ahead to the right. Luis Suarez and Daniel Sturridge swapped between the left wing slot and the lone striker role, with Raheem Sterling a permanent fixture on the right. John Flanagan came in to the side for the injured Glen Johnson at right back. Everton welcomed back Ross Barkley and Steven Pienaar into their usual 4-2-3-1 formation, meaning that Kevin Mirallas returned to the right flank. Jon Stones and Antolin Alcaraz were in defence in place of the injured Seamus Coleman and the absent Sylvain Distin. Everton have consistently featured one of the most distinctive and easily identifiable styles of play in the Premier League this season – it’s a 4-2-3-1 possession-oriented approach, with a high block, a high defensive line, a narrow band of three in behind Lukaku and both full backs bombing on. Rodgers set up his team to exploit this system, rather than impose his own. He matched up man-for-man in midfield, with Gerrard on Barkley, and Henderson and Coutinho pressing McCarthy and Barry. Raheem Sterling, operating on the right of midfield, was given the responsibility of tracking Leighton Baines, before bursting in behind him on the counter. Suarez/Sturridge, on the other side, were instructed to stay higher. This meant that Jon Stones, Everton’s right back, had a difficult choice to make – would he push on and attempt to maximise the consequent freedom that this afforded to him? Or would he stay at home and monitor Liverpool’s attacking threat on that side. He chose the former, more often than not and eventually paid for it. Liverpool’s first goal came from a Suarez corner (Gerrard with the header after losing Barry in the box), but their second goal demonstrated the wisdom of their manager’s approach and the folly of his opposite number’s. Raheem Sterling won the ball on the half-way line to break up a nascent Everton attack. He played the ball to his left to Coutinho. Jon Stones had taken up an advanced position in anticipation of his side working the ball forward. This meant that Sturridge (at that point playing from the left) was free in behind to pick up Coutinho’s through ball. 2-0. Minutes later, it was three. A simple long ball from the back from Kolo Toure bisected Everton’s central defenders. Sturridge found himself clear through on goal and hooked a beautiful lob over the stranded Tim Howard. Howard demonstrated again tonight that he’s not the greatest off his line – a quality that a side intent on playing high desperately needs in their goalkeeper (see Hugo Lloris). His “challenge” on Raheem Sterling that led to Sturridge’s penalty miss was further evidence for the prosecution. Everton lost Lukaku midway through the first half and were forced to introduce Steven Naismith in his place. This exacerbated their attacking problems. 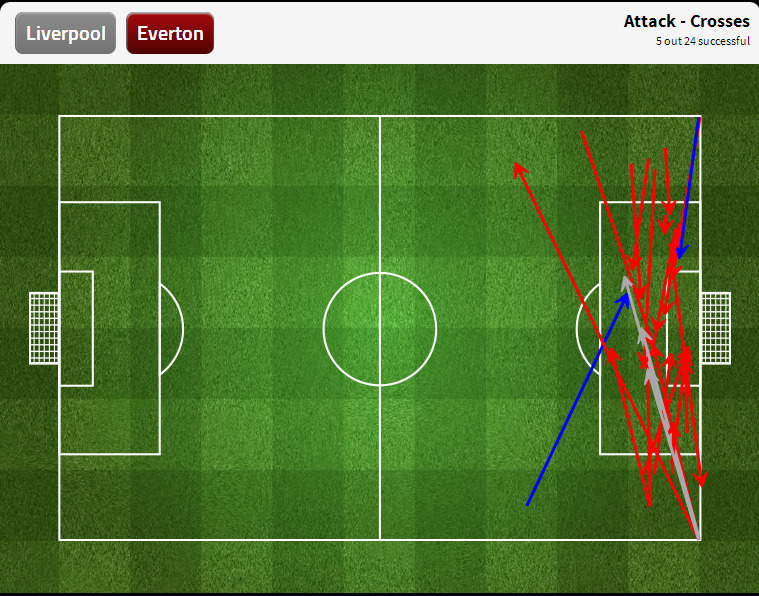 Liverpool were already defending narrowly to counteract Everton’s band of three attacking midfielders. This meant that they were allowing some crosses, particularly from the often free Stones (who completed 0 of his 5 attempts). After Lukaku’s injury, Liverpool were narrower still, safe in the knowledge that Naismith was far less likely to win an aerial duel. This increased the crossing frequency from the away side – the final count was 24 to 5 in Everton’s favour. Only one cross was completed from open play, however – an early lump into the box from McCarthy that Lukaku flicked out of play. Liverpool were delighted with this state of affairs, particularly Martin Skrtel at centre back, who completed a massive 22 clearances over the course of the game. Meat and drink to the lad, as the Tim Sherwoods of the game would say. Liverpool were full value for the three points here. They formulated a plan to nullify and counteract Everton, and executed it to perfection. They blunted their array of attacking midfielders and exploited the space in behind their high line brilliantly, completing an impressive 3 through balls – two were scored, one (a volleyed pass from Sturridge to Sterling) should have been. Everton can have no complaints. Martinez was totally outsmarted here, and had no plan B on which to fall back on. Any subs he made were like for like, and he may have regretted letting Jelavic go given how many failed crosses his side put into the area, particularly late on. His side had 58% of the possession in the first half, yet completed 1 shot on target to Liverpool’s 8. They had even more ball in the second half as Liverpool dropped off even further, but could only manage 3 more shots that tested Mignolet, all of which were from outside the area. The scoreline did not flatter the home side by any means.